We have opened this post into a link party! 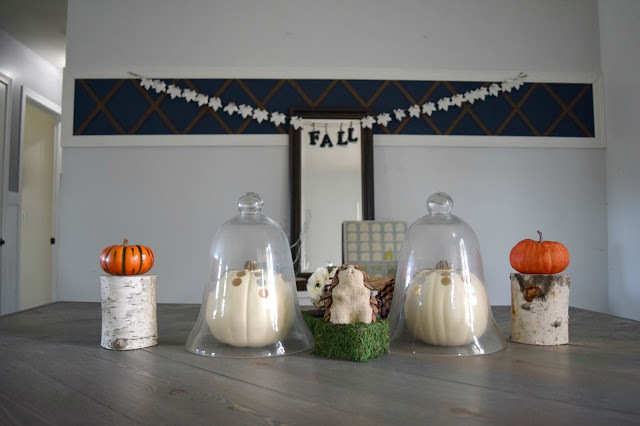 If you have any fall decor, or tablescape that you want to show off add your link at the bottom of this post! Also, we are following on social media, if you want to share there use the hashtag #createandshare. 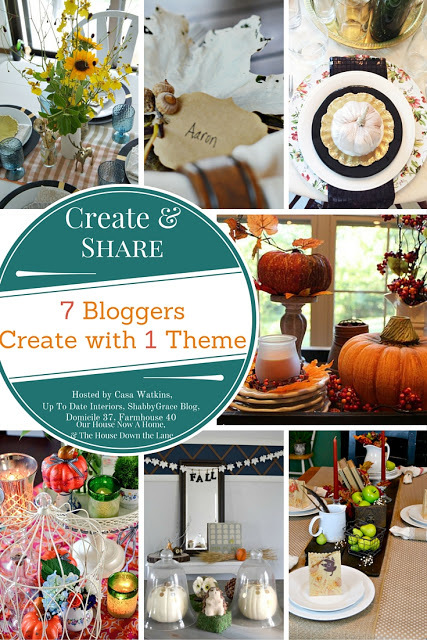 Myself and the other 6 bloggers will be looking out for your fall creations! Hi friends! Today is a little odd for me. Here, let me explain. I have been waxing poetic about enjoying the last little bits of summer, sharing some summer projects. Annnddd… today I am sharing a fall project. I know, it is confusing. No matter how much I adore summer I know it will end, fall is coming. The kids have back to school night tonight, we meet their teachers, and take their school supplies to them. I wore a sweater yesterday because it has been crazy fall-ish already here in Wisconsin. So this little challenge me and my blogging friends undertook made sense. 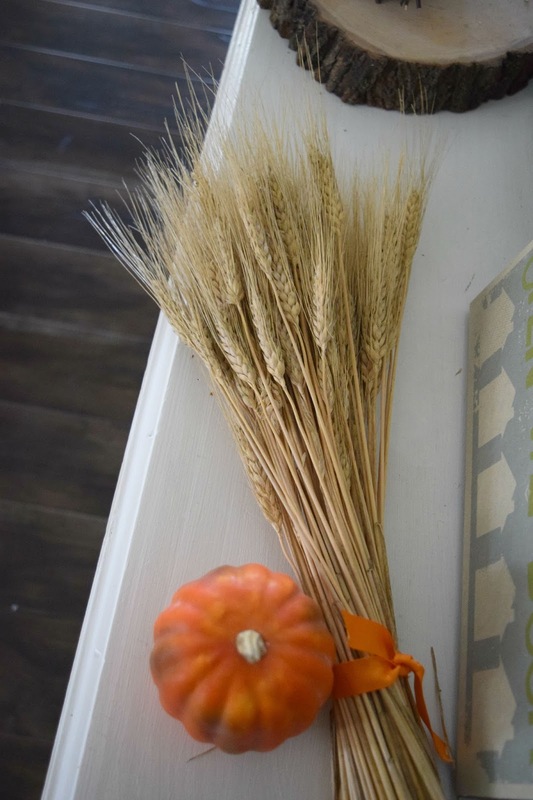 We decided to get crafty and create some fall tablescapes. We all know how I enjoy collaborating with my blogging friends. 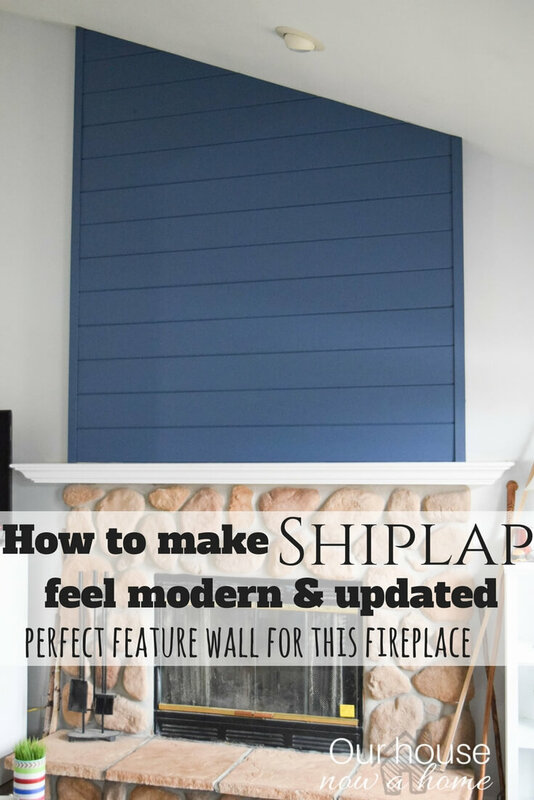 We also know how much I adore decorating, hence this whole blog. Me and 6 other bloggers are sharing some creative fall tablescapes. Oh, we also all are sharing a diy projects within this tablescape. Yay for learning new things! With me still enjoying and holding on tight to the last days of summer, I wanted to share a light fall dining room. A early fall tablescape if you will. I am all for the changing of the seasons, and each new season creeps in. We no longer have the hot and humid days of summer. But, we still have leaves on the tree’s and no need for a coat. So this tablescape is the appetizer to fall decor. The main course of fall decor will come. I am just getting things out and putting my brain in the realm of fall. 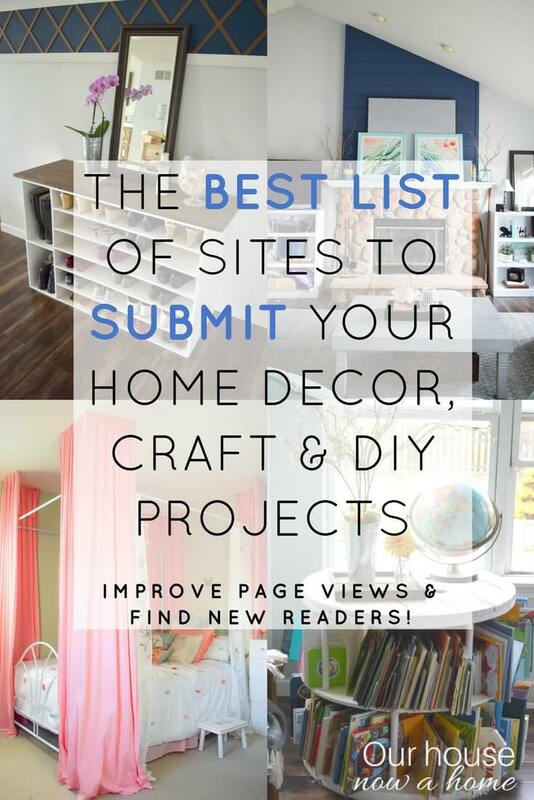 I am also stalking Pinterest like no ones business for any and all fall inspiration. 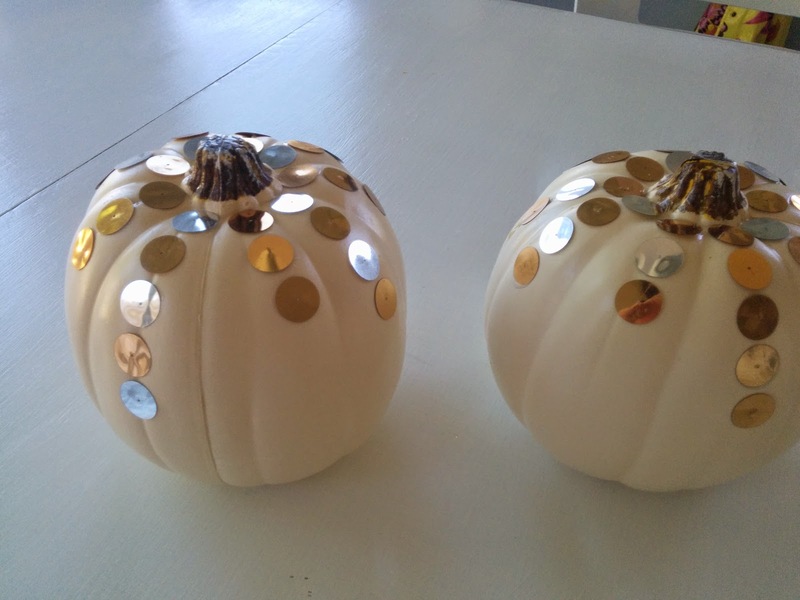 I created these sequin pumpkins last year. It was my first time working with sequins professionally. I say “professionally” because I use glitter on the daily with me being a Mom and all. My kids are seasoned sequiners. I had never used them for home decor projects. 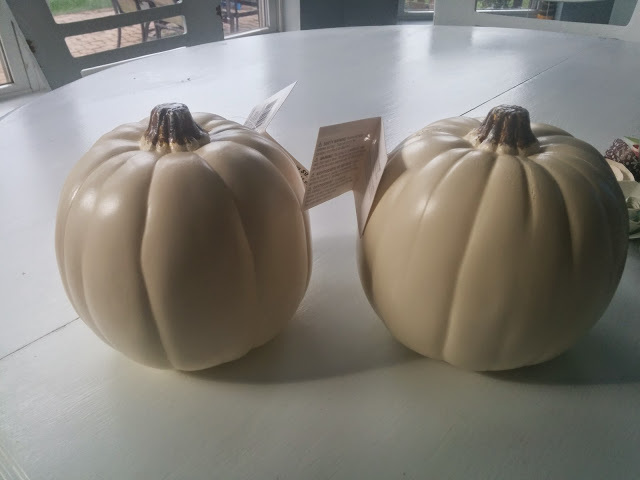 I purchased these two beige pumpkins from Michaels craft store. I wanted to add some detailing, I was thinking orange. But orange is so, well pumpkin like. I can do better then that. Then I spotted these gold sequins. Gold, brown, and orange are all synonymous with fall. No, sequins are not. But I made it work. It is making them fancy as my daughter says. 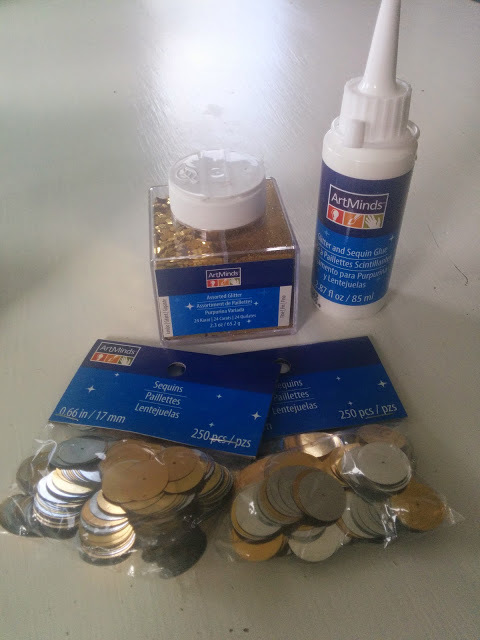 I purchased some sequin glue. I put a small portion of glue down. Used mostly gold, adding a few silver in. I created one row using three, then another doing 5, and then one doing 3 or 4. It was really basic and simple. And all up to me and what I thought looked good. 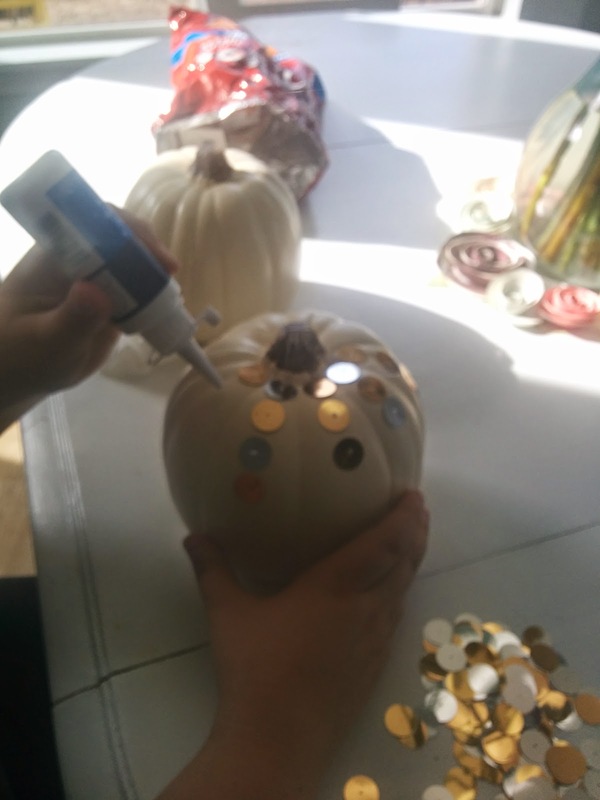 The glue was white, and never having used sequin glue before. I do not know how I have raised three kids for seven years and been a big fan of DIY without using sequin glue. Anyways, I was hoping and assuming the glue would dry clear. Otherwise this project would not be a success. Drum roll please. It dried clear. The smudges and gook under the sequins all went away. 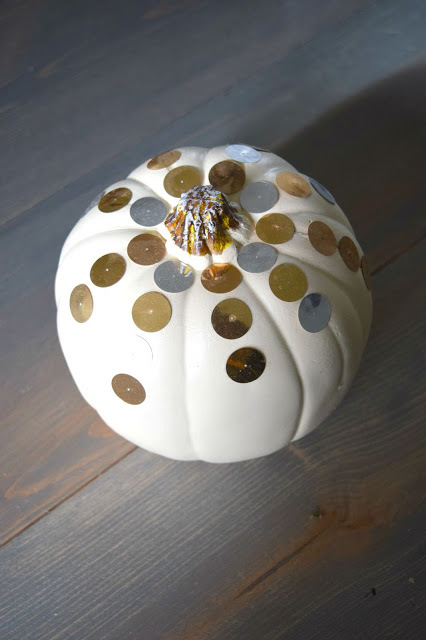 These sequin pumpkins are subtle and fun all at the same time. Just like me…. 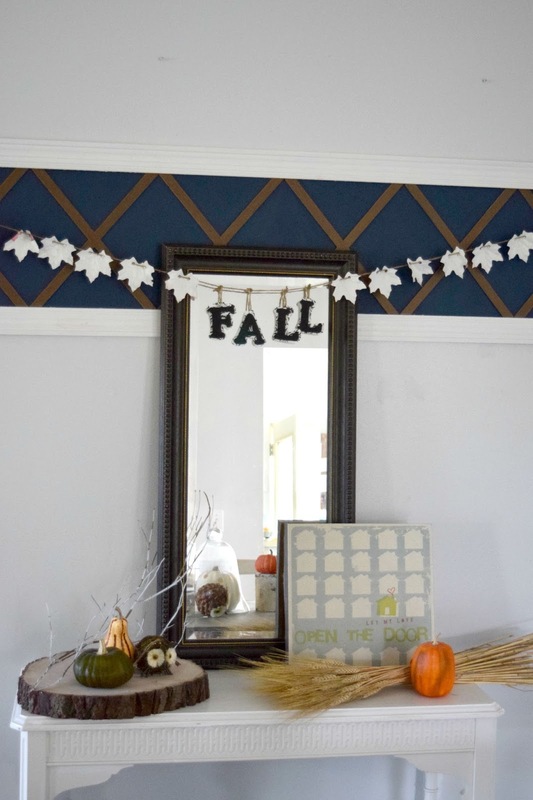 The rest of what I made to bring this early fall decor into fruition were things I already had at home. 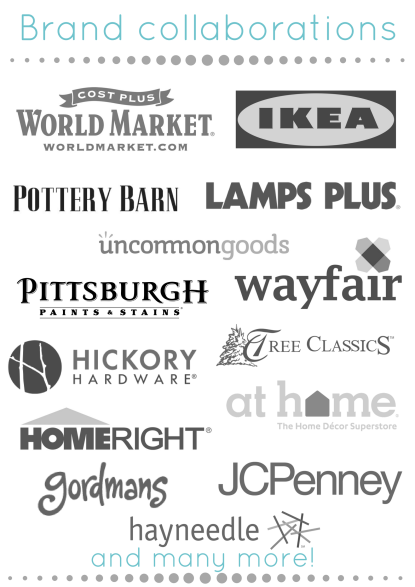 I got to shop my basement. I received this beauty of a console table from my Grandma. We stayed at her house in California and she has been a DIY-er before it was cool. She found this table on the side of the road about 15 years ago, repaired it and painted it. She insisted we bring it home with us. I of course was enamored with it. I am loving the layered look of frames lately. I have always done the traditional with pictures that is either hanging them on a wall or setting them on a table using the little support back thingy (not actually what it is called). However, this layered look of multiple frames, sizes, and levels is so pleasing to the eye. I just purchased this mirror from Goodwill about two days ago. I plan to paint it and fancy it up. Confession time. 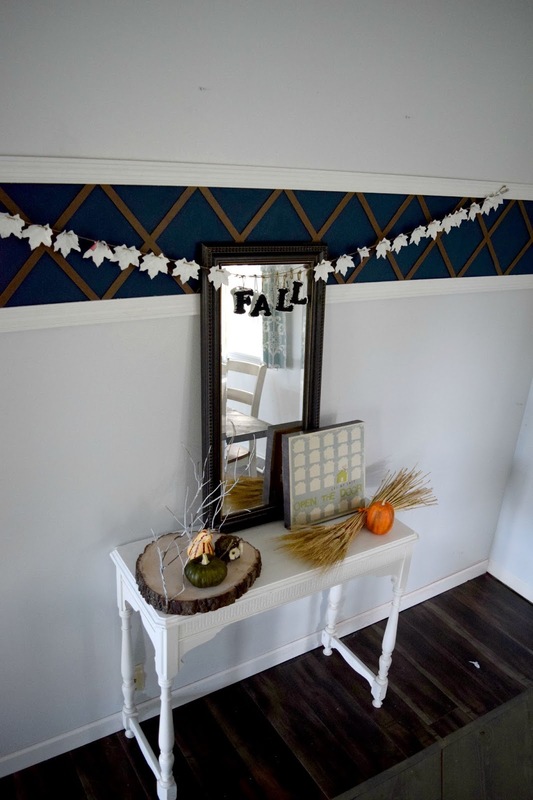 I made this fall garland last year, took pictures of it and never shared it on the blog. I cannot find the pictures anywhere. I know I have them somewhere, and will share the tutorial if I can find it. I like the simplicity of the white leaves and the black words. I think having all orange for fall decor can get boring and a little much. Bringing in softer colors can add a breath of fresh air to fall decor. I found these two glass domes at Goodwill. 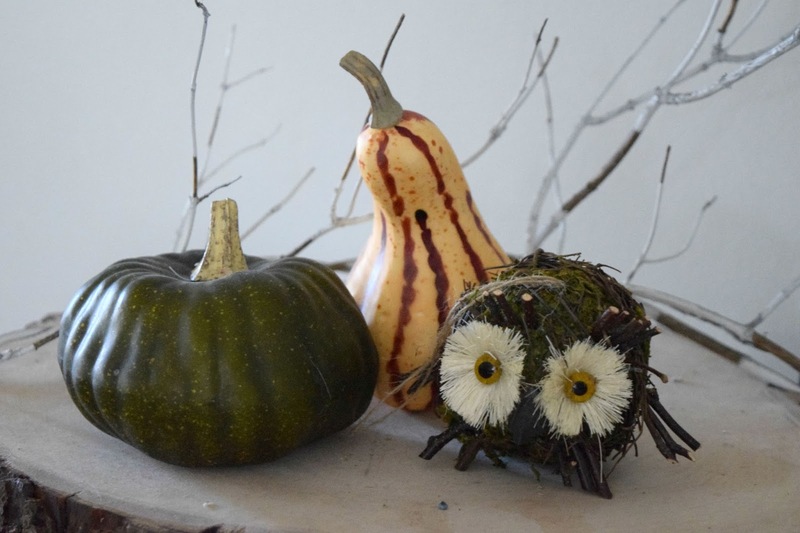 The pumpkins from the dollar store, the adorable woodland creatures at Michael’s crafts. I made the moss squares, you can see the tutorial here. I think the mix of whites, beige, brown with pops of green and orange make this tablescape seem natural. I simply piled everything I was interested in using on the table and started layering it. Don’t be afraid to move stuff around until you find the set up that works. 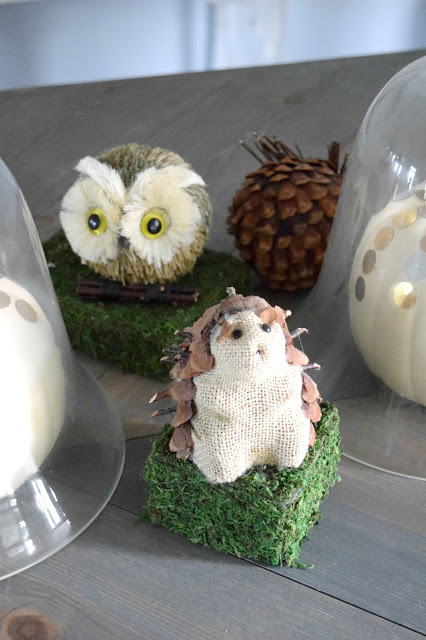 Owls and woodland creatures have my heart all year long. With fall my love goes into obsessive territory. I am not sure why, but fall screams woodland creatures. It makes sense in my head and I roll with it. I purchased these tree trunks from Michael’s craft store on a whim. I had no plan for them and no immediate use for them. It was a good purchase. I move these things around like crazy. I really like using them to add differing heights and layers. These work great for that. I really hope I can find the pictures of the process of making this. It was perfectly simple and low cost. It involved things from the dollar store. If you are new around here, let me explain something. I like the challenge of not spending a lot of money. 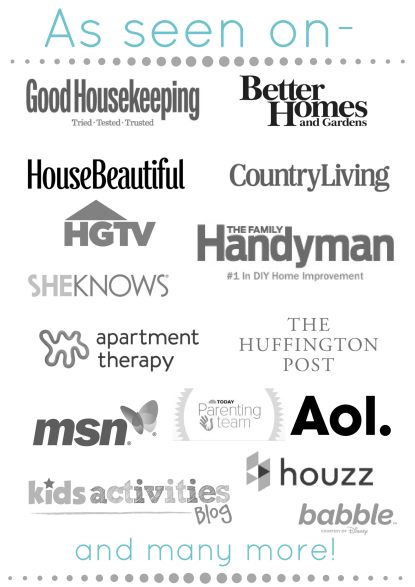 I want to show people the you really do not need a mega budget to change up your home. To decorate for each holiday. I like to show nothing but a idea and some guts to try is all that is needed. I need one more thing, a better system for older pictures in my computer archives. Is it too early for New Years resolution? Fake wheat, who knew the perfection of these? The color of the wheat adds to the neutral tones of this early fall decor. I had intended to put these in a tall vase, but they were too tall. I did not want to cut them. I felt it would limit my use of them in the future. I actually set them sideways like that while I continued layering the console table. I looked over and saw how perfect it all fit. Sometimes the perfectly imperfect work for home decor so well. Also accidental decor set up. I am a real pro here, obviously. I had so much fun setting this up. I like the simple and subtle look to this. I have never really gone the neutral and white colored fall set up. I seem to always gravitate to the bright and loud orange in fall. I have to say, this set up has made me do some deep thinking. Don’t we all spend way too much time overthinking home decor? I know I do. This is why we all get along, you speak my language and day dream in color tones and future home projects. 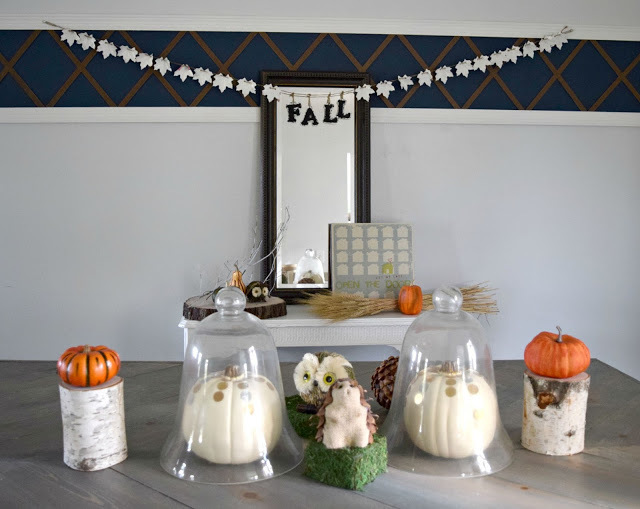 This early fall decor has gotten me excited to get out all of my fall trimmings and see what is going to work. 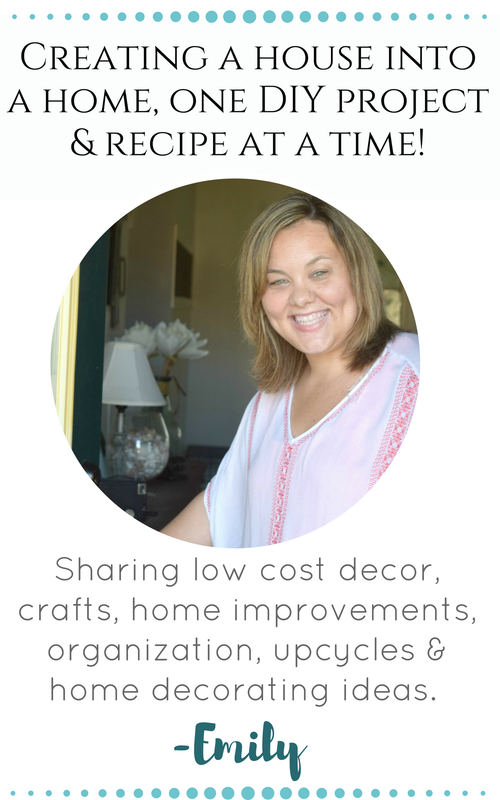 It also has me brainstorming about some neutral, light and airy fall decor for me to create. Have you gotten out your fall stuff yet? If not, when do you usually take on that task? Everything looks great Emily. You're too funny, I know I say that a lot. The appetizer to fall and first time using sequins "professionally." So glad you started our group! I am so happy that you get my humor. I always worry that it just comes off as awkward. Starting the group was amazing and turned out better then I dreamed it would! Oh how pretty! I have to admit, I love the little hedgehog! That little hedgehog is such a cutie! 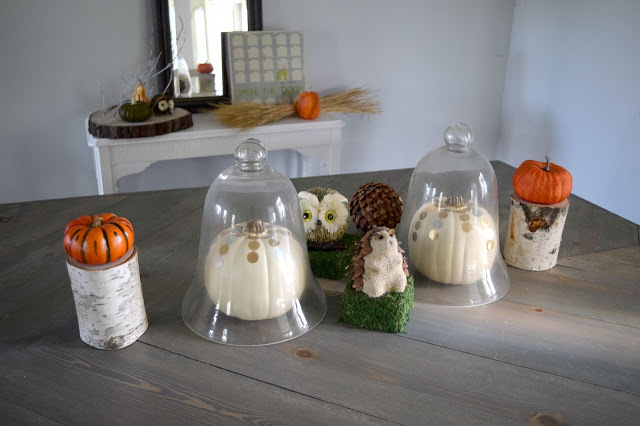 The pumpkins look so cool in those glass jars. They are reminiscent of bells. I love the woodland creatures and your moss stands. Everything looks great. 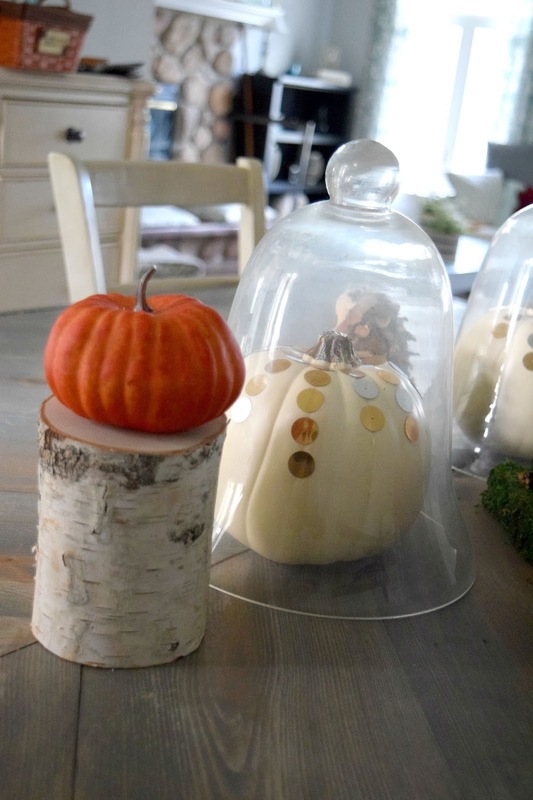 Great pumpkin look with the jars. Your decor looks wonderful. Great job! Thank you so much! I had fun with the pumpkins and did something different with them. I love this!! The wheat on its side looks perfect – love when I'm staging photos and look over and realize something like that actually looks perfect as is! Those accidental decor happenings are so fun! 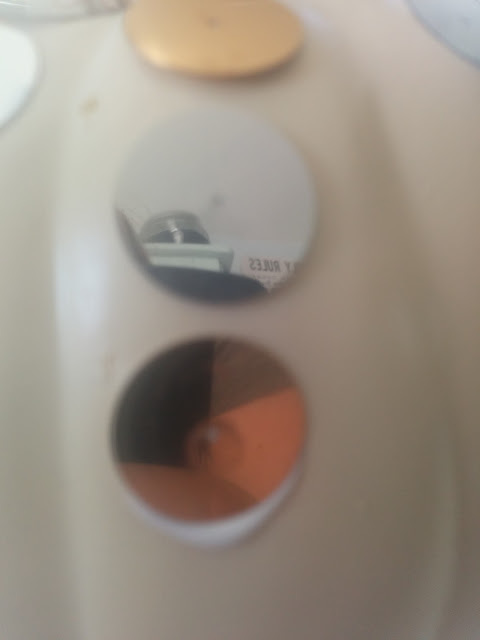 It always catches me by surprise and usually makes me see things a new way. Great job! I love the pumpkins inside the vases! You did a great job and love your combination of decor! 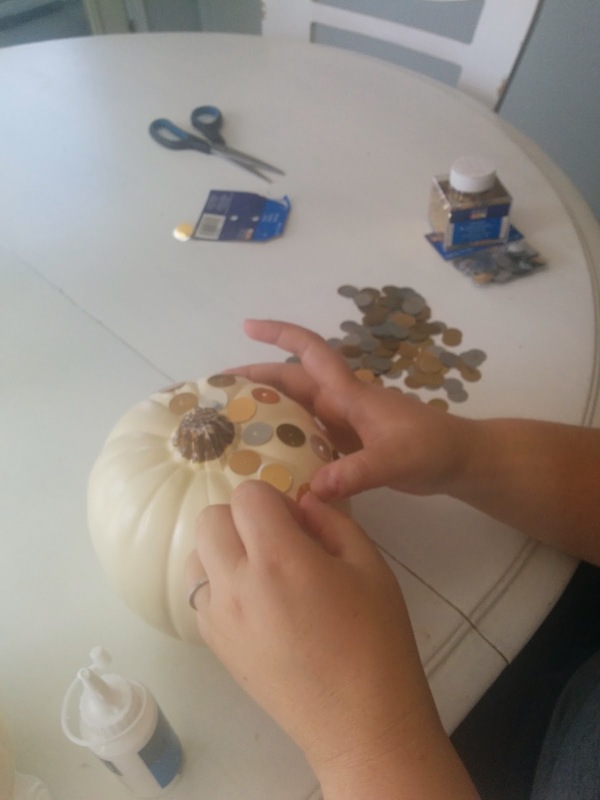 Way to dress up a pumpkin! Love it! Thank you! Sequins make everything feel fancy. Even thought I love summer I am super excited for fall and the holidays! Hi, Emily ~ Love this fall tablescape! I love the pumpkink glam and the woodland creatures are so cute! I've been wanting some birch or aspen logs for a long time, and I love how they on your table! I love that you called it pumpkin glam. I will be using that in the future, thanks for the idea! I am so happy you liked how I decorated my table. I love it! All of it! Made me want fall to be here it has always been one of my favorite times of year! The sequined pumpkins are so pretty and I love all of the Fall critters. Too cute! Loving the fake wheat! 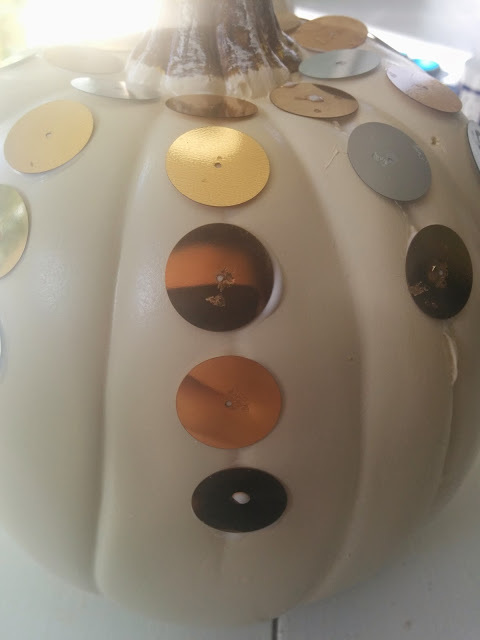 And those sequin pumpkins are the funnest little detail. Thank you! 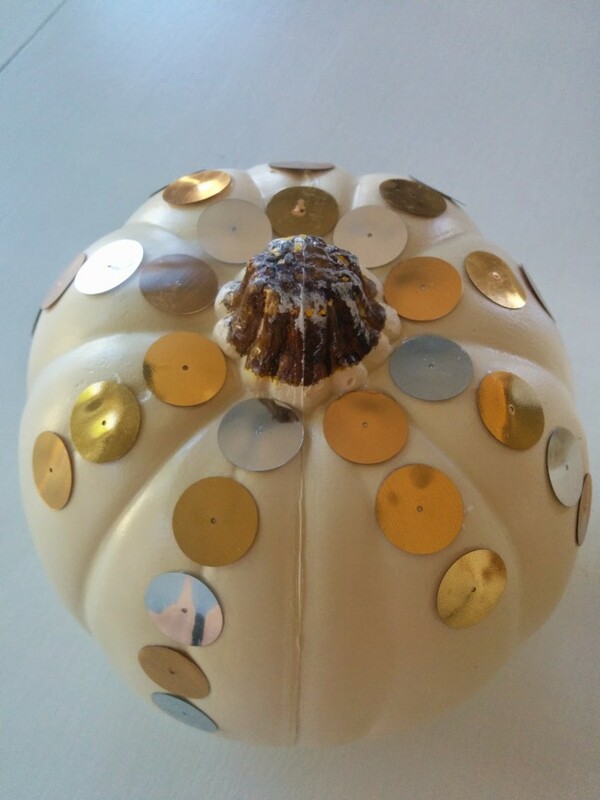 I am not usually a sequin on pumpkins kind of girl, but this works. Very pretty fall decorations! Great job! And you captured it by these great pictures! I love these pumpkins. So simple but yet they are just the right amount of fall decoration. 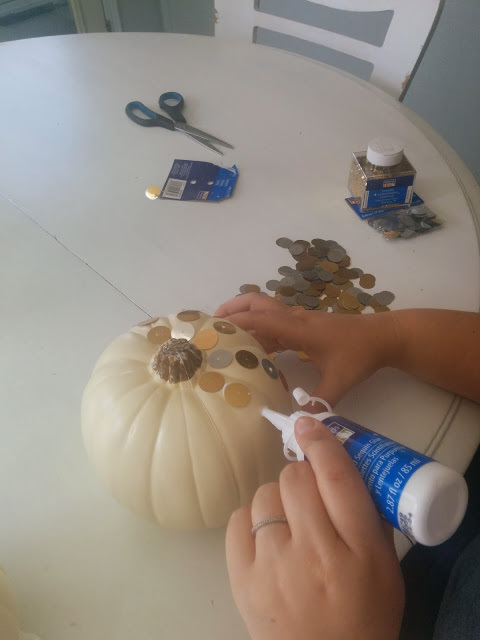 Going to try this with my kids when pumpkins come out. Thank you! Having kids help out with putting the sequins on them would be fun! Love it Emily!!!! The cute animal friends are so adorable! 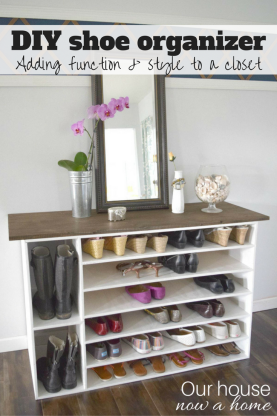 Great use of the sequins and a great activity for kids. 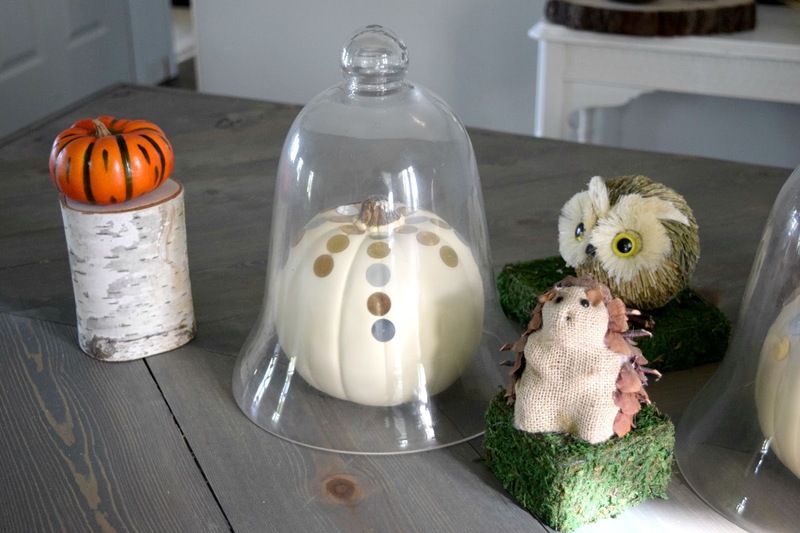 I like the addition of the sequins to the pumpkins, and I love the little woodland animals! 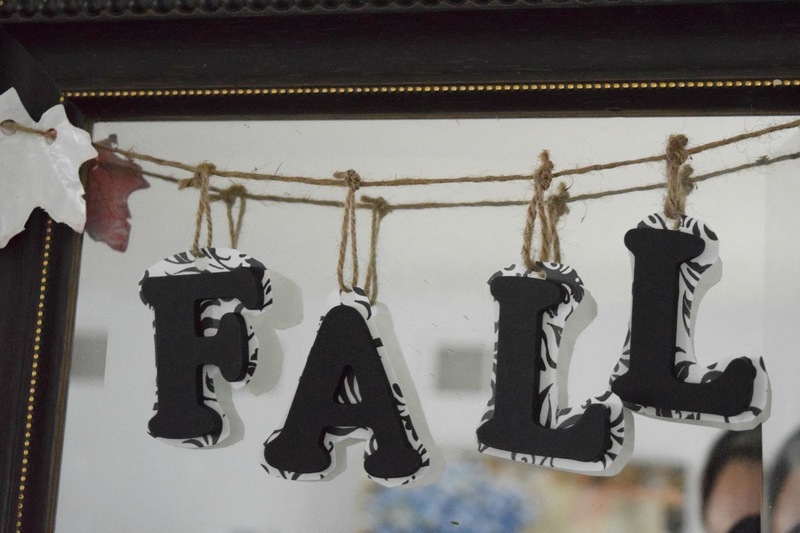 Thank you for sharing at the Finding Fall Link Party!